The Maternal Data Center (MDC) is an online web tool that generates near real-time data and performance metrics on maternity care services for hospital participants. Hospitals submit patient discharge data – data that they already collect – to the MDC, which instantaneously links the discharge data to birth certificate or clinical data. The result is a low-burden tool that gives clinicians the perinatal performance metrics and benchmarking data they need to drive quality improvement. Click here to see what the Maternal Data Center can do on our Demonstration Site! 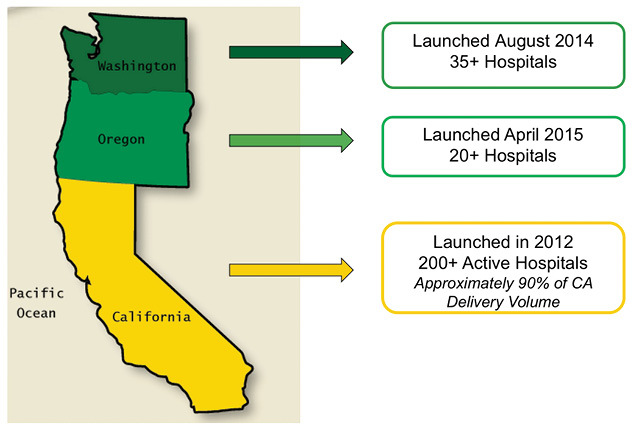 The Maternal Data Center is currently available to hospitals with Labor and Delivery units in California, Washington and Oregon. More than 200 hospitals are demonstrating their commitment to monitoring and improving the quality of perinatal care through MDC participation. Download our California participant list here. Please see Washington and Oregon's webpages for their participant information. Visit our interactive Demonstration Site to experience all the functionality of the MDC for yourself. Schedule a time for your hospital to learn more by contacting MDC Project Staff at datacenter@cmqcc.org.